Admin Arsenal was founded in 2001 as a systems management consulting firm. That may sound impressive, but it was really just a way for Shane, Shawn, and Adam to earn money doing Tivoli and Microsoft gigs. It worked really well, but after a couple of years Shane and Adam started talking about creating a systems management tool that would fit well with small to medium companies. After coming up with this ground breaking idea, Shane and Adam promptly set themselves to ignoring it. They pushed it down. Way down. We’re talking total repression. After another year of denial they came to themselves and decided to move forward. Following several overt threats to his family, Shawn finally agreed to transition the company from consulting to sales of systems management software. In 2006 the coding began and in 2007 we sold our first license of AA Console, a predecessor to our PDQ family. PDQ Deploy and Inventory came after testing the market waters from 2007-2010. Admin Arsenal is headquartered at the base of the Rocky Mountains in Salt Lake City, Utah, U.S.A. Deploy multiple packages quickly. Select multiple packages to see a new menu allowing you to quickly deploy, nest, or schedule your deployment. Set end times for your scheduled deployments. Schedule deployments to end at specified times. When you use this setting any computers still left in the queue state will not receive the deployment. For Enterprise Users only: Add custom steps before and after your Auto Deployments. Use this new feature to run commands, add messages, perform reboots, log off users and more alongside your scheduled Auto Deployment. 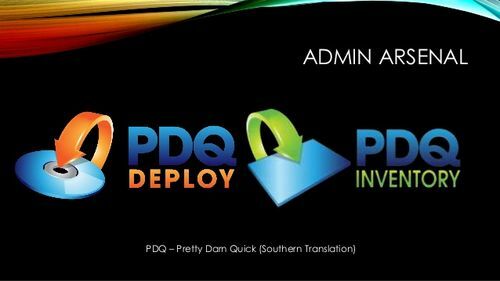 Use PDQ Deploy to install applications and patches to all the computers in your company. Pro and Enterprise mode customers have access to pre-made packages ready to deploy. NOTE: Trial users have access to up to three applications to deploy. Full access to the library is not provided during your trial. PDQ Inventory 7 scans your computers and collects hardware, software, and Windows configurations. In addition, PDQ Inventory allows you to run scan inventory reports, boot machines from Wake-On LAN, execute commands and remote desktop on target machines, and many other features. PDQ Inventory scans your computers and collects hardware, software, and Windows configurations. In addition, PDQ Inventory allows you to run scan inventory reports, boot machines from Wake-On LAN, execute commands and remote desktop on target machines, and many other features. All of our free mode software is 100% free to use in any setting. Commercial, government, educational, criminal (well, maybe not that last one). You are free to share the software with friends and colleagues, as long as it’s not modified in any way (without our written permission). Our Pro and Enterprise mode products are licensed per admin user of the software. Licenses are not based on the number of managed computers or the number of PDQ consoles, it is only based on the number of living, breathing admins who use our software. There is no limit to the number of consoles a company may install PDQ Deploy or PDQ Inventory on. A single admin may require multiple consoles to do his/her job. As long as the consoles are used only by that administrator, a single license would be needed. If additional admins use the same console(s), then you would need a multiple admin license. A PDQ console should not be used by more than one admin simultaneously. If admins require simultaneous use of a console then multiple consoles should be used. When used with an Enterprise license (with the appropriate number of licenses) then admins can share data between other admin consoles. Want to upgrade to Enterprise mode? If you currently have a Pro mode license and would like to upgrade to Enterprise mode contact us for a quote to upgrade. Make sure to include the email of the current license holder’s email as well as any contact information. The license holder’s email can be found under File > Preferences > License in PDQ Deploy or PDQ Inventory.